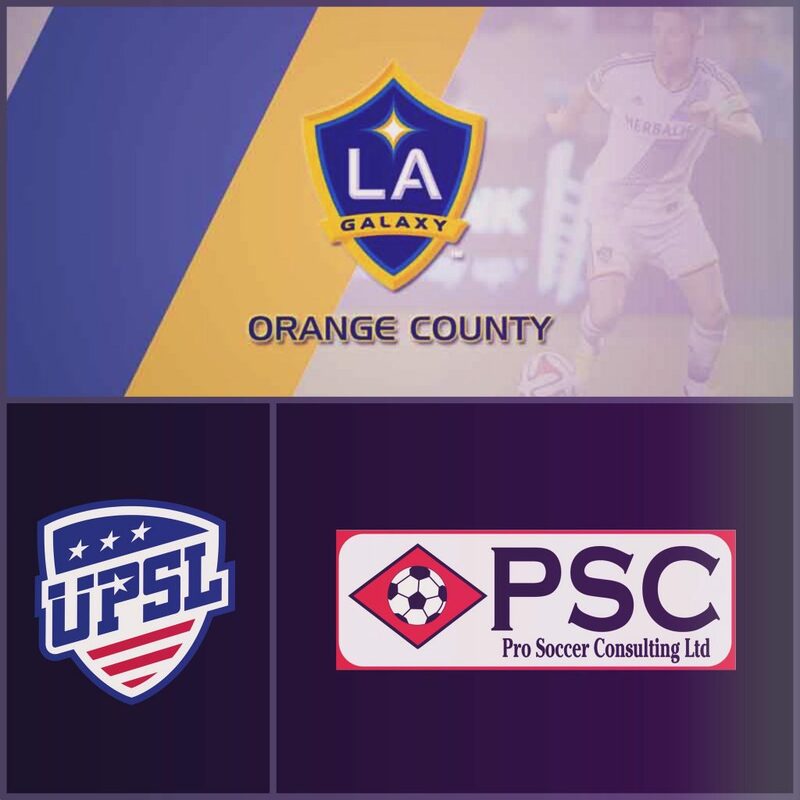 PSC (Pro Soccer Consulting Ltd) is proud to announce a newly-formed partnership with LA Galaxy Orange County (LA Galaxy OC). Looking to expand the company and create further opportunities for players, PSC will be linking their existing UPSL Programme and team (PSC FC) with LA Galaxy OC – providing a pathway for local Orange County youth players and aspiring professionals to reach the highest levels of the game. PSC, a company which facilitates individuals’ progression into professional game, has helped more than 300 North American-based players secure professional contracts and trials in Europe, Asia and the USA over the past seven years. LA Galaxy OC, an alliance club of Major League Soccer’s most successful franchise, the LA Galaxy, operate male and female teams from U8 to U18 levels – delivering expert coaching and player development models, while providing clear pathways to the highest levels of soccer. Alongside assisting in showcasing individuals’ skills to high-level clubs, the PSC-LA Galaxy OC partnership will offer daily professional training and competition in the UPSL Pro Premier Division, aiming to develop players’ overall game. Former Major League Soccer (MLS), North American Soccer League (NASL) and Major Indoor Soccer League (MISL) coach and player, Guy Newman, will be at the helm of the team – and speaking following the announcement of the PSC-LA Galaxy OC partnership, he said: “This is a partnership of two forward-thinking organisations: PSC and LA Galaxy OC. “There are many young soccer players who are looking for a pathway to a higher level, but with limited opportunities in the States, it’s very difficult. Sharing Newman’s optimism on the partnership, LA Galaxy OC Director of Operations, Tim Woodcock, said: “We are very proud to announce the LA Galaxy OC men’s team, and to be working with Tom Taylor [PSC Director], Guy Newman, and PSC. 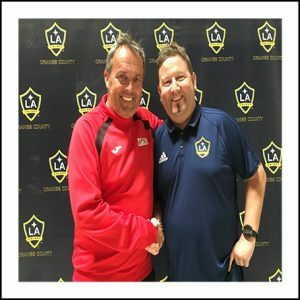 All Smiles: Guy Newman (left) and Tim Woodcock shake hands following confirmation of the PSC-LA Galaxy OC partnership. Working alongside Newman during the 2018 UPSL campaign will be PSC Director Tom Taylor, who spent a number of years playing and coaching in the USL, with clubs including the Tulsa Roughnecks and Wilmington Hammerheads. 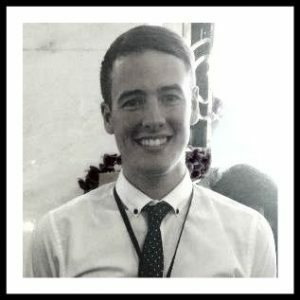 Reflecting on the PSC-LA Galaxy OC partnership, Taylor said: “After speaking with Tim Woodcock, it was an easy decision to begin this partnership. I’m delighted that the UPSL Programme will now impact a wider range of local aspiring youth players. “We had players from all over the USA on our roster last year – and even one individual from Australia. This new partnership means we will be seeing more local faces, while continuing to work with players from various different countries and backgrounds. “Obviously the ultimate dream for the programme’s participants will be to play for the LA Galaxy’s MLS team, but we realise that not every player will take that first step into the professional game. We expect to see some players take alternative routes to the higher level, with our extensive network of contacts in the USA and Europe meaning we have the ability to send standout players from the programme into clubs at all levels – from the top to the lower tiers. PSC and LA Galaxy OC’s pre-season training is now underway, ahead of facing Valley United in the opening game of their 2018 UPSL campaign on March 17. If you are interested in becoming a part of the 2018 UPSL Programme roster, please e-mail your details and playing background to UPSL Programme Head of Recruitment Matthew Couchman (info@pscltd.co.uk). To visit PSC’s website, click here. To visit LA Galaxy OC’s website, click here. 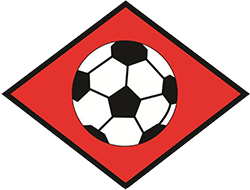 For more information on the UPSL, click here.